When the Washington Revels asked my wife and me to be part of their 2015 production, me as a principal performer and us both as mask makers and “tradition bearers,” we were delighted and honored to say the least. However, I was also extremely taken with the responsibility of conveying the artistic aesthetic known as the “Mythic Arts” to the Washington Revels community. This article is a small attempt to introduce you all to the threads of that form, and from its tangled weave we hope to bring a whole cloth to your understanding. Any myth-conceptions or mything-links are entirely the accident of this writer. The term, Mythic Arts, was coined in the 1980s, but the ideas of it stretch into our neolithic ancestry. The very beginnings of human culture are the myths of our hunter-gathering forebearers, and it is firmly upon this foundation that the modern Mythic Arts imagery is built. The stories that our distant grandparents told to call the animals to the hunt, explain the natural world, and keep the dark at bay are the table upon which our feast of fairy tales and fables is laid. Indeed, when thinking on the traditions that Revels represents, and the spirit of Jack Langstaff’s vision, I realized we are bearing traditions to a home they already live in. From this distant time, we receive the transmission of these stories and imagery. They have continually influenced human thought and in some ways all our civilizations are mythic of one form or another. If we start to draw upon too many of these threads, the fabric of what I am trying to convey may become untangled. Therefore, instead of exploring the rootings of these ancient tales we will allow them to lie fertile in our imaginations and stay more within the modern era. There are, however, in the not so distant past some important influences that we must consider. First there is the impact of the Pre-Raphaelites and their offspring. It would be impossible to detail their contribution to the arts as a whole in so brief a space. Their attention to natural details, story, romantic imagery, realistic form and pose, and the very capturing of light and life was revolutionary and controversial in its time, and they remained outliers in the arts community for many years. 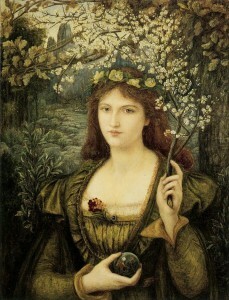 The direct inheritance of the Pre-Raphaelites impacted the Art Nouveau and Symbolist styles, influenced advertising, storytelling and illustration. This met with the Arts and Crafts revivals of the late 19th century and together a somewhat perfect storm of elegance in line and form in many artistic disciplines came about. Most all of this was to be discarded by Modernism and Expressionism of the 20th century and the nature-derived myths and romantic styles would be quietly tucked away, awaiting a future age. One can hardly understand the modern revival of interest in myth and fairy tale without considering the similar growth of the late 19th and early 20th century fairy tale books and illustrators. The advent of publishing truly for popular culture had reached a period where stories could be told with lush artworks to excite the imagination. The drawings of famed illustrators, such as Arthur Rackham, H.J. Ford, Walter Crane and others, were joined with collections of the Brothers Grimm and Andrew Lang. The collection and preservation of such stories had come to be more respected in academic circles, and without the efforts of these early mythologists and folklorists, and the popularity of their publishing as story’s for children, we would have lost many of them into the mist of time. A fascinating direct connection to this period and the Revels Tradition is the works of Andrew Lang. His “Color Fairy” books have become a fundamental storehouse of fairy tales. Meredith Langstaff, father of Jack Langstaff, founder of the Revels, was a collector of Lang’s works in books, manuscripts and personal papers. The exposure to these at an early age influenced Jack’s own storytelling, and though known among Revelers as the founder, he was also an acclaimed writer of books for children, winning many awards. Meredith Langstaff’s collection was later donated to Harvard University, where it still resides. These luminaries continue to deeply inspire many of the artists illustrating today both in the old stories and more modern twists. These artistic threads seemed to have been quietly tucked away. The ravages of the world wars and the global change that came after seemed to have left little time for fairy tales and romanticism. Still, small pockets of the mythic wood were nurtured and sheltered among the postwar meetings of the “Inklings,” in the writings of Tolkien and Lewis, among others. Elsewhere, fairy tales had come to be almost entirely a child’s genre. It was the very works of Professor Tolkien that helped to bring them back out of the nursery again in the Western world. Tolkien’s popularity struck just at the time the world was indeed changing, and looking back to romanticism and myth to gave it solace in a troubled age. This was, of course, the late 1960s, and the burgeoning resurgence in all things mythic found fertile ground then. As well were the works of mythologist Joseph Campbell. Mostly unknown until the popular TV series in the late 1980s, “The Power of Myth,” Dr. Campbell’s work quietly influenced and was a guide to the mythic imagination for generations of filmmakers and creators. Indeed, the foundational series by George Lucas, “Star Wars,” was a direct reimagining of Campbell’s “mono-myth” told in “Hero with a Thousand Faces,” showing that myth and knights, brave heroes and rogue archetypes do not only live in ancient lands but in galaxies far, far away. Through these many rootings a generation was primed and fed on myth. Dr. Campbell called those youth who first saw Lucas’s films the “Star Wars Generation” and said that we might “re-mythologize the world”. By the middle 1980s the older kids of that generation were coming of age and beginning to create, and a world of mythopoesis was at their fingertips. Inspired writers, artists, and creators of all kinds were beginning to rediscover the stories of the past and find them relevant, and creating new stories that dipped from a common well of mythic imagination. One key book that came of this time was the work of two illustrators, Brian Froud and Alan Lee. The book was called simply “Faeries,” and the two artists collaborated on a rich tapestry of imagery accompanying ancient tales and folklore of the “Good Folk.” Both artists went on to other influential work, but this key book serves as a touchstone of early Mythic Arts. I know that personally, I often say that it shaped my thinking and appreciation of illustration in important ways. It was an escape in imagery and was one of three similar books published at the time, the equally famous “Gnomes” and the less well-known “Giants”. 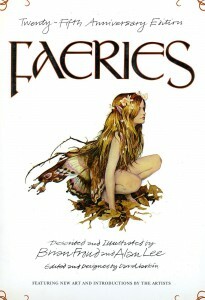 Today there are many such titles on the shelves, and fantasy fans can find hundreds of options of similar inspiration. Yet at the time they were somewhat unique in their style and presentation, and many fans of the genre mark them as turning points. There were many other books to come, and films too. Brian Froud, went on to make the signature film “The Dark Crystal” during which he met his wife, Wendy and they, together with their son Toby, helped create “Labyrinth.” Fantasy films were finding a new market, and a new way of telling stories. While the sword and sorcery style still had some relevance, it was clear that audience and filmmakers, fantasy fiction fans, and writers were reaching for something more. The fans were creating their own tales at the time as well. Around many tables on late nights, quests were undertaken, ancient evils were being conquered, and brave heroes were finding a path through the dice and rules of Dungeons & Dragons and other tabletop role playing. I find a deep personal relevance in this. It was D&D that gave me a shared community in my youth, and helped me find many others who loved the tales and wonder that I did. It is not a great leap to point out that around those early tables of gamers, many of our current stories, and even some of the technology and companies of today, were first seeded. I often wonder how different the world would be without that. Into this came a voice of some influence. Terri Windling, a young writer, artist, and editor, recognized a growing community of fellow artists, all tied by a mutual love of myth, folklore, fairy tale and more. She helped coin and popularize the term “Mythic Arts” and was diligent in connecting the roots and threads of that diverse creative field. Together with fellow editor Ellen Datlow she recognized new and established writers touching on the genre, and through numerous anthologies and collections helped establish a true network of “Mythics.” In 1987 she co-created the Endicott Studio for the Mythic Arts in Boston and later a virtual “salon” and the accompanying Web magazine, Journal for the Mythic Arts. The lists of the early members of the studio reads like a who’s who of current creatives in fantasy and mythic fields: Holly Black, creator of the Spiderwick series; Brian and Wendy Froud, mentioned earlier; Charles de Lint, known for his urban fantasy work; Neil Gaiman, one of the most popular writers of today, creating works for print, movies, and television; Ellen Kushner and Delia Sherman, acclaimed writers and supports of the field in their own way; Charles Vess, illustrator and creative, who is responsible for this year’s Christmas Revels poster; the well-known Jane Yolen, an amazingly prolific writer and poet. All of these and more became a circle of friends inspiring each other, supporting works and projects, and fostering a love of imagination and wonder needed by so many. 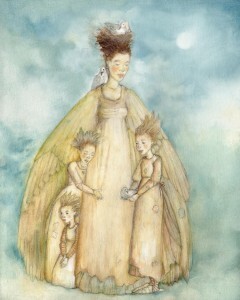 It’s no surprise that many today view Terri as the “Fairy Goddess Mother” of the Mythic Arts. These wanderers in the dark woods marked the trails for many to follow, as the younger generations of those times came of age and began creating their own stories. They knew the way amongst the forest of tales was opened to them. The creative people in films were paying more attention as well. Of special note is the important effect the “Lord of the Rings” films had on fan culture as whole, and the Mythic Arts in particular. Based on the works of J.R.R. Tolkien, and inspired by the illustrative work of Alan Lee and fellow artist John Howe, they were a “sea change” on the world of fantasy and film. I view them as the “coming out party” for the Mythic Arts in a way. Suddenly the tales of Tolkien I had loved so much as a child were popular the world over again and the illustrators I admired were being discovered by new fans. In many ways the fan and creative communities can mark the day as transitioned by the films. There was before LotR, and after. Suddenly the conventions and gatherings were inundated with new fans and older ones returning. Being a “fantasy geek” was cool, and creative people were being paid attention to in new ways. The coming years would see many new properties in film, comics, and art inspired by the Mythic Arts. Video games were well part of that. As the technology for graphics and computers increased, the images we could imagine through them became more and more complex. Indeed, the ability to visualize the old tales in new ways was sharpened by the skills of this very new technology. Millions of fantasy fans regularly engage in their wildest dreams via gaming and the art of the story is of vast importance to the genre. Like the art movements of the past, but perhaps in a more subtle way, the Mythic Arts have fostered more than just illustration and film. The influences of the past progenitors of fairy tales and their modern caretakers continue to shape the arts of all kinds. 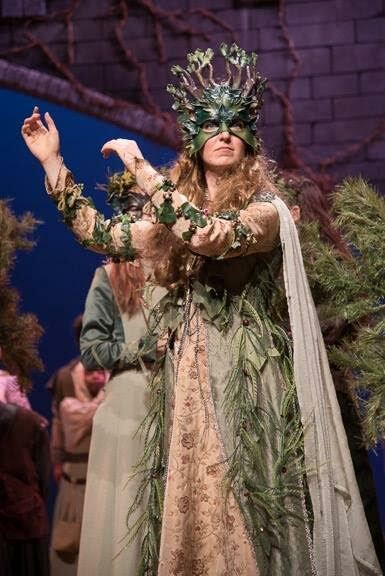 In costuming, design, sculpture, music, and of course in theater, the gleam of a world half glimpsed can be seen. Festivals and events with either fairy tales as a central elements, or perhaps along the edges of things, continue to spring up. Indeed, in our own art forms as maskers and mummers, the vast bulk of our designs are drawn from legends both ancient and modern. The stories we tell in our craft are often instantly accessible, even without foreknowledge of the tales that might have inspired them. The simple understanding that the “Green Man” is a “Father Nature” spirit and plant elemental is graspable for children and seniors. Whether it be a knowledge of the metaphorical nature from a study of ancient traditions, or associations with comic book or movie characters, in many ways, the stories never change and the inherent form remains. It’s been many years now since the turn of the new century and growth of Fantasy and Mythic Arts. The kids who experienced the LotR trilogy and Harry Potter as a fundamental part of childhood are creating their own myths and perhaps sharing those with children of their own. Despite more than a decade of global unrest and change or perhaps because of it, fantasy, myth, folklore, and fairy tale are more needed than ever. Countless films, television shows, books, comics and other media, has reached back into the depths of time and shown it to be relevant today. Connecting our interlinked global community with our deep ancestors around those ancient fires and in the torchlit caves. Reminding us that grand tales matter, that dragons can be conquered, that small things can make a great difference, and old myths can be imagined anew. The future is indeed now, but the past and the lore we tell to make sense of it still carries us through each moment in our personal journeys and indeed, into each season. Those tales carried by the way finders in the Mythic Arts are lights in the darkness, and can help us see that the path ahead is clear. By finding the tales that move us, and reveling in them, we can know the secret at the heart of the forest, and become our own lights of guidance. Now folded, the studio was a nonprofit to encourage and support the Mythic Arts. They produced the Web journal, and issues would often focus on particular mythic topics. Drawing on artists, writers, and poets in the field, they are an excellent starting point to explore the mythic forest. Annotated fairy tales, golden age illustrations, discussions and more.